Music Costs > How Much Does a Tuba Cost? How Much Does a Tuba Cost? The tuba is the largest of the brass instruments and also provides the lowest tone in a band. The tuba is a very rewarding instrument to play, especially in an ensemble where it is considered as the foundation of the band. How much does a new or used tuba cost? On average, the cost of a tuba will depend on the brand, condition and where it’s purchased. Most experts note a good tuba will cost $3,000 and $6,000, but the prices can range anywhere from as little as $2,000 to more than $11,000. The table below showcases the range for the most popular types of tubas on the market. Tubas come in four common keys: F, Eb, CC and BBb. The BBb is the most common tuba and can handle just about any situation, while a CC is intended for those who want to play in a symphony orchestra. At Woodwind Brasswind, for example, the best sellers range from as little as $3,700 to more than $9,000. This eBay guide says it’s hard to offer an estimate, but, in general, an average tuba in EEb or BBb should cost about $3,000 to $4,000, but a very good EEb or BBb for the average student can cost upwards of $6,000. Serious professionals should budget at least $6,000 to $12,000. Sizes will vary, but most common sizes include a 4/4, 3/4, 5/4 and 6/4. 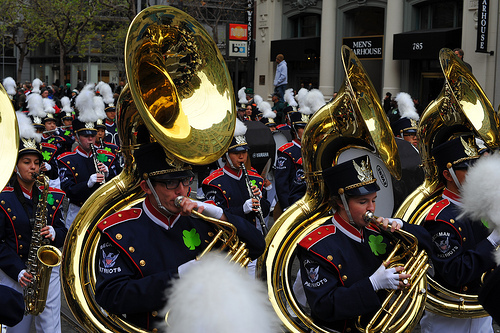 A 4/4 is referred to as a full-sized tuba due to its respective key, is the most commonly purchased, while a 3/4 size, which is designed to accommodate smaller players. The 5/4, known as the Kaiser tuba, and the 6/4, are built much larger than the standard sized. The average full-sized orchestral tuba will weigh 25 to 35 pounds. As for the valves, there are two common types: the piston and rotary, with each offering its own advantages and disadvantages. The rotaries work from the front of the horn, whereas the pistons, either front, front with an angle or a top action, will have its own setup. A piston valve with an angled front action will point inward between the front and the right side of the horn, for example. Pistons, in general, will be simpler in mechanics, but they will need to be oiled more frequently to keep them in tip-top shape. Rotary valves, on the other hand, are more complex mechanically and will require less oil, seeing they are enclosed and run cleaner for a longer period of time. Tubas need at least three valves to play all notes of the scale, according to this eBay guide, and will need at least four valves to play a lower note in tune. An additional mouthpiece can cost $10 to $75, depending on the brand and materials it’s made from. For example, the highest rated seller, a glory standard mouthpiece, on Amazon.com retails for $18. While optional, lessons may be required to learn how to use the instrument. Average lessons start at $45 per hour and go up from there. If you know what you’re looking for, consider buying a slightly used tuba on eBay for up to 70 percent off the retail value. A good used horn should have all of its pieces, a tuning slide that works freely and valves that work smoothly as well. Even if there’s a noticeable dent, the instrument can still play properly as long as the mouthpiece can insert snugly, and, again, the tuning slides move naturally. In general, a dent should be less than an inch in diameter. As with any retailer, always look for coupon/promotion codes or hold out for a sale before making a purchase online or even locally. A tuba can be quite an investment, and if you’re not committed just yet, consider renting one for less than $50 to $100 per month.